After going completely defeated last year in their debut Division I-AA season, the SF State rugby team hits back with a vengeance. This season, the Gators will focus on getting more wins against division rivals like Stanford, Chico State and San Jose State, but has its sights set on an even loftier goal: to make rugby SF State’s big-ticket, spirit-rallying contact sport. Rugby’s appeal, he said, comes from its fast pace and hard hits, similar to football, but without the padding and helmets. With the Gator football team depart in 1995, the rugby team is looking to become the go-to spectator sport that brings fans to the bleachers — much like football does at other universities across the nation. “We want to get word out as a rugby playing school,” said player Jameel Madanat. But one obstacle stands in the way of the team’s goal: recognition. The team, which formed eight years ago, is not part of the SF State athletic department, and only gets a yearly stipend of $250 from campus recreation. The rugby team is an official club on campus, so each member must pay $150 per semester to the team for travel expenses, referees, and field rent. ASI has yet to acknowledge and fund the team — and this means the Gators can’t host tournaments and train like their competitors do. 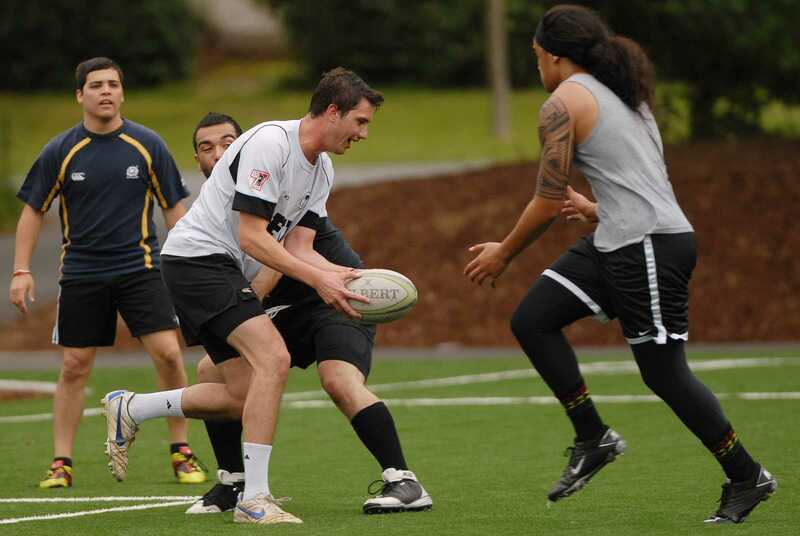 The rugby team joined the Division I-AA league to compete at a higher talent level — a step the players said could make them a bigger name in the college level rugby world and, therefore, on the SF State campus. “Those programs are well established, and we’re looking to build SF State and work with the University to establish ourselves in those rankings,” said head coach Dean White. The past three years, the team has bounced back and forth between divisions. After placing third in its Division II bracket back in 2010, the team fell to Division III the following year, going undefeated and racking up a +198 point differential from competitors. The team secured its spot in the Division I-AA bracket in 2012 after University of San Francisco forfeited its match against the Gators in the middle of a 67-0 rout. Even with a jump in division rankings, the team struggled last season after several key injuries hit. In rugby, the game stops for no one unless an ambulance needs to be called, and last season this happened on two separate occasions. This year, he said, the team is healed up and ready to play. Though the team struggled last year in its new division, its successful trajectory through the rugby ranks gives its players high hopes for the season to come and, ultimately, its status on campus.